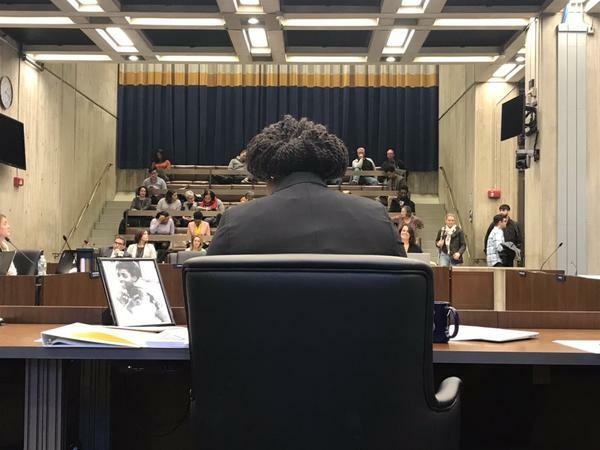 On Wednesday afternoon, Ayanna Pressley sat at her usual place in the Boston City Council chambers. To her left, a black-and-white photo of her late mother faced her on the desk. Her family sat in the chamber, to her right. And as she sat there, one by one, her fellow — and soon-to-be-former — city council colleagues, through tears, wished her good luck and farewell as she heads to Washington, D.C., to assume her newly elected position as the representative from the state’s 7th district. 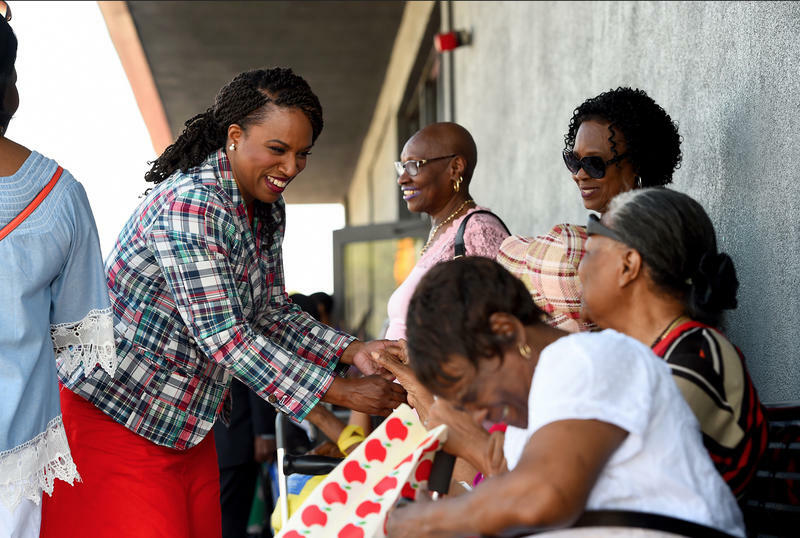 Pressley had once made history as the city council’s first elected woman of color, in 2009, and she made history again in September when she defeated longtime Democratic incumbent Michael Capuano for the congressional seat. She will now be the first woman of color that Massachusetts has ever sent to Congress. A member of her “squad,” Congressman-elect Alexandria Ocasio-Cortez of the Bronx, was also in the audience. Ocasio-Cortez had, a few months before Pressley, also ousted a longtime Democratic white man from his congressional seat. City Councilor Lydia Edwards called Pressley a “great destroyer of glass ceilings” and said she’s “living and breathing and setting legacy,” crediting Pressley for leading the way for more women of color to join the city council like herself. Edwards recalled bumping into Pressley years ago when they were both neighborhood advocates. “Never ever in my mind would I have thought I would have been one of your colleagues,” Edwards said. When it came time to address the chamber, she went to the lectern. She first thanked the interns, the custodians and the security guards. “I can say with pride that every person I’ve served with, each resident I have come into contact with, has changed me and our city for the better,” she said. Pressley recalled Avi Green, formerly with MassVOTE, encouraging her to run for the at-large city council seat. In fact, she said, Green predicted Pressley would be the first woman of color on the council. Instead, Pressley said she just continued to work for then-Sen. John Kerry and help women and young girls. She gave out her cellphone number to girls in need and would get calls about girls kicked out of their homes. Girls in need of feminine hygiene. Girls just in need of advice. It was then, she said, she realized that black and brown girls were being ignored. City Councilor Michelle Wu praised Pressley for bringing the voices of those not heard to the foreground — immigrants, people of color, members of the LGBTQ community and women. Pressley intends to go to Washington to champion Medicare for all and more gun control. She said she’s hoping for a position on the House Committee on Education and the Workforce or the House Judiciary Committee. In a surprise defeat that reflects a changing Democratic Party, Boston City Council member Ayanna Pressley has defeated 10-term Democratic Rep. Mike Capuano in Massachusetts' 7th Congressional District. Pressley is poised to become the first African-American woman to represent Massachusetts in the state's congressional history. "It's not enough for Democrats to be back in power," she said at her election night celebration. "It matters who those Democrats are." On Sept. 4, Boston Citywide Councilor Ayanna Pressley unseated 10-term congressman Michael Capuano. She is poised to be the first African-American woman to represent the state of Massachusetts in Congress, as there is no Republican on the November ballot in her district. Last week, WGBH News' Director of Photography Meredith Nierman spent the day with the candidate and discussed what she encountered. What made you decide to do this project? There is a changing of the guard in the 7th Congressional District, with shockwaves sure to reverberate throughout the Democratic Party. 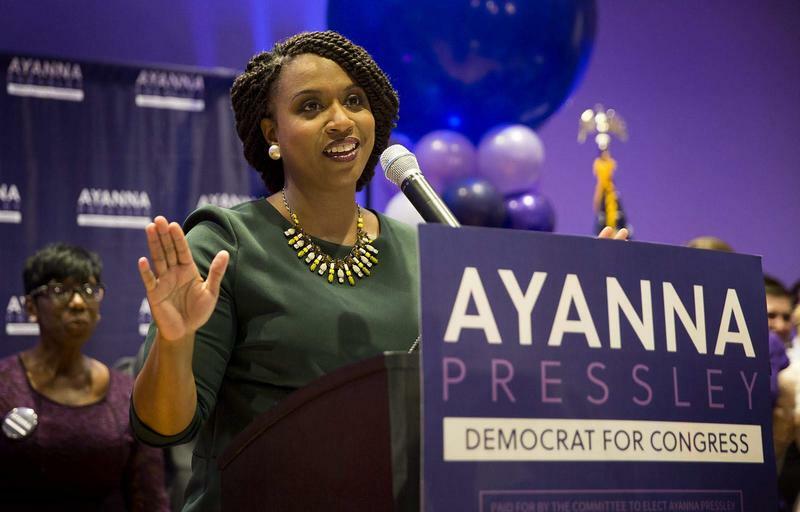 Ayanna Pressley, the first woman of color elected to the Boston City Council and a self-described candidate of change, easily toppled U.S. Rep. Michael Capuano, a 10-term incumbent, in an intra-party tussle that garnered national attention on Tuesday. With no Republican opponent, Pressley is set to become the first black woman to represent Massachusetts in Congress.